NOTE: If you have a handstand, go for max handstand walk distance OR try a handstand push up. If you don’t have a handstand, practice head-stands & frog-stands. 20″ box, 2:1 single unders. I did my best to represent CFRX while dropping in at CF Memorial Houston (http://www.crossfitmemorialhouston.com/) this morning. 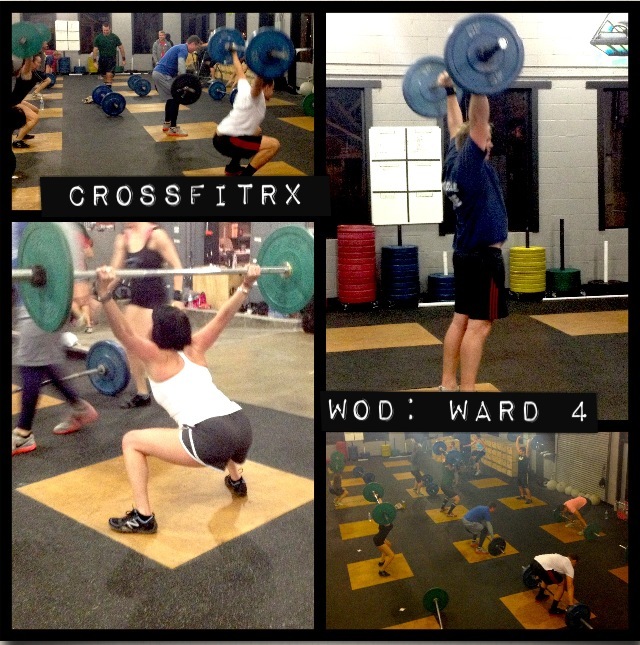 Burpee Boxjumps and Sumo DL High Pulls to start, then metcon of Push Jerks (135#) and Pistols (10-9-8-…). Upside-down practice was fun! All that core work (plus three yoga classes in the past week or so) we’ve been doing is making me stronger! 4 rounds + 20 for the metcon, with box steps and assisted pull ups. HB to young Preston, who is 30! 5+6 doing singles + awesome case of rope burn on the shin. Congrats on the handstand, Meeks! handstands are getting wayyy better! 6 rounds Rx for the metcon and only one rope burn! Great job on the metcon, Ethan! And I see lots more hand-walking in your future. Mod WOD my arm hurts. Hope your arm recovers quickly, Amy! Hey Miss Amy – I thought you were going to rest. You gave in to temptation?? Take care of yourself. Mama’s orders! Preston, you have a great life ahead of you if you’re crossfitting at your young age. Happy Birthday! Sooo happy to get back to the gym today after a cold kept me away. Glad you’re feeling better, Joy. What kind of shoes did you get? I am in the market for lifting shoes (possible) and new all-around cf shoes. thanks. I feel like a baby walking for the first time! I walked a few steps today upside down. Although I need much more practice and shoulder strength, I’m making progress! Metcon- 4 solid rounds! I got some new red, tribal, tiger stripe tattoos today from the double unders! Thank you all for the advice today after the WOD! I appreciate those of you that coached me through some of my mobility and form issues and for the extra push to get me rockin’ out those bar muscle ups like a true champion! CROSSFIT RX, Thank you for the inspiration today! What a fab attitude. Keep it up!